Create a balanced mix or listen to your music in true honest details with the Yamaha HS7 studio monitor. Equipped with a 6.5" white cone woofer, 1" silk dome tweeter and 96 watts of bi-amplified power, the HS7 is the perfect balance of size, power and tone to fit into most home and professional studios. 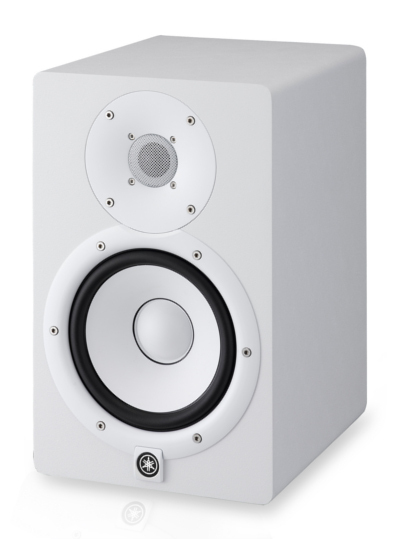 The Iconic white cone with black casing will ensure the speaker looks as great as it sounds. The HS7 monitors are bi-amplified meaning there is a split amplifier for both the high frequency and low frequency drivers. This separation allows the designers much more control over the sound therefore resulting in a more accurate speaker. There is 95 watts of power from the HS7 speakers which is separated by 60 watts of low frequency amplification and 35w of high frequency amplification. The rear panel of the HS7 studio monitor has 2 dedicated controls to modify the sound of the speaker based upon its environment and positioning. HF TRIM allows boost or cut of the high frequencies to compensate for hard or soft room environments where high frequencies may be absorbed or reflected by the surfaces. To accompany this is a room control switch. This acts as a boost or cut for the bass frequencies and comes in use to compensate for speaker positioning close to walls. Bass can be emphasized when speakers are pushed close to walls and corners so this will balance out the sound to keep it as natural as the speaker was designed for. The HS7 monitor controls are simple and effective. It is important the sound is not modified to far away from the original speaker design or your resulting sound will not be "true". By keeping the controls simple you can combat the environment differentials without ruining the natural sound character of the monitor design. The HS7 Series monitors features newly developed transducers which offer a much smoother response over a wide range of bandwidth. These transducers utilize an advanced magnetic field design that regulates the flow of magnetic response to provide seamless, natural sonic transitions. Each component&apos;s materials and design were carefully re-examined, then optimized, to drastically improve the accuracy of signal reproduction throughout the audio spectrum. The new tweeter design extends the usable frequency range considerably and delivers superb high-resolution sound. Utilizing a thick wave guide designed to minimize vibration the new tweeter is able to deliver smooth, distortion-free high end up to 30 kHz. The HS7 monitors produce low distortion sound with a well-defined bottom end with the newly developed woofer. All of the components in these high-power woofers, including the woofer ring and the basket further contribute to the HS Series&apos; stunning bass while providing clear, accurate mids.